Vajra Yogini, the trauma goddess, appears in the form of the Hindu Goddess Durga carrying a trident and says, "Let us discuss suffering." Most people have a deeper, unconscious layer in their personality which is like a land which flows with rivers of sorrow. The land grows plants and flowers but their roots reach into waters of pain. 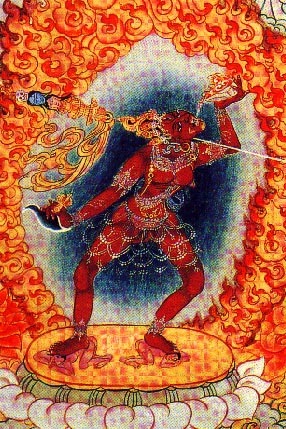 Vajra Yogini shows a primitive land, and a place of dinosaurs and jungle creatures to illustrate what this layer of the personality is like. Elephants cry in the distance and volcanos rumble. She strikes the ground with her trident, and black polluted waters flow out. They are full of beings writhing in pain. In response to the question: "Can these waters be stopped? ", she answers, "No, because they are not limited to this land, or to an individual or even to a group." The waters go down, down beyond this land. They are part of the greater universal waters of pain, the source of suffering for all of the worlds. The universes run on sorrow just as cars run on gas and oil. Pain is the universal substrate. The Buddhist understanding is that all life is dukkha or suffering. The person's localized river of pain cannot be stopped because it is like a tidal river connected to a vast ocean of pain. It cannot be escaped because it is universal, a basic aspect of embodied existence. The river of pain cannot be ended but it can be limited. This is not done by ignoring pain and becoming numb, but by transforming it. As beings evolve spiritually and are liberated from their pain in this life and in previous lives, their previous self, which was grounded in pain, must become a new self grounded in compassion and the recognition of pain in others. Human beings are not the only ones who suffer. There are galaxies, universes, whole dimensions of existence which are conscious and suffer. This is a universal substrate, not just the collective consciousness of mankind or even of the earth. This suffering pervades everything. Do you think Bodhisattvas are happy? They can be miserable. There is so much suffering and often so little they can do. Do not be led astray by Tibetan Buddhist smiles. Buddhism is recognition of sorrow, plain and simple. But Yoginis and Dakinis have greater freedom than bodhisattvas. We are not bound to suffering. We have room for artistry and creativity that Bodhisattvas can only show in their paradises. Many children suffer and experience the betrayal of love in childhood. But the world is full of traumas for children. Children are sold, beaten, raped, and enslaved. Those who love change into people who hate, or are uncaring. Those who suffer often feel isolated but they are in reality fully part of the world, for the world is full of loneliness, betrayal, and suffering. There is a vast army of those who have been betrayed and suffer. They simply don't show their membership cards. This is why confessional groups like the 12-step and anonymous groups are so popular. They allow people to recognize their betrayals and suffering. Silent suffering is destructive while shared suffering is liberating and creates deep bonds. Do not turn your eyes away from pain. It is not there to be enjoyed as we see in the twisted values of the entertainment industry. It is there to reveal the finite and tragic nature of individual human life, and to motivate people to look deeper. For most people, life is hard, lonely, and painful. They try to attain status and wealth and beauty to escape from their pain. But this just increases ignorance if they use these distractions to hide from pain rather than learn from it. Pain reveals limits and limits must be encountered. One cannot escape from a cage if one cannot see the bars. As the earth is created from liquid super-heated lava, individual consciousness is created from liquid super-heated pain. Pain is the limitation on infinity. Every creation of the finite brings pain. Only when the finite is left behind can we have joy. But the current state of the world has its collective perception clouded by volcanic ash. This accompanies volcanic creation, hiding suffering behind a cloud of obscuring darkness. The sunlight is gone and people are left in darkness. So they turn to the fires of the senses seeking light. There are bonfires of conflict, and in wars and competition, people find meaning. There is dark sexuality and sensuality, and in piling up varieties of pleasure, people get brief glimpses of joy. There is the substitute joy of power and control where the glory of creation becomes dominance, and eventually callousness and cruelty. Group or tribal identity substitutes for universal identity [such as identifying with all mankind or all sentient beings], and it cannot rest and must expand until everyone becomes part of the group. Thus we get wars - cultural, economic, and religious.